Another commission piece completed! I’ve been working hard lately to catch up on some commissions that have been eluding me due to adjustments to the pump, school-year start-up, etc. etc. Feeling a bit lighter with each one completed! 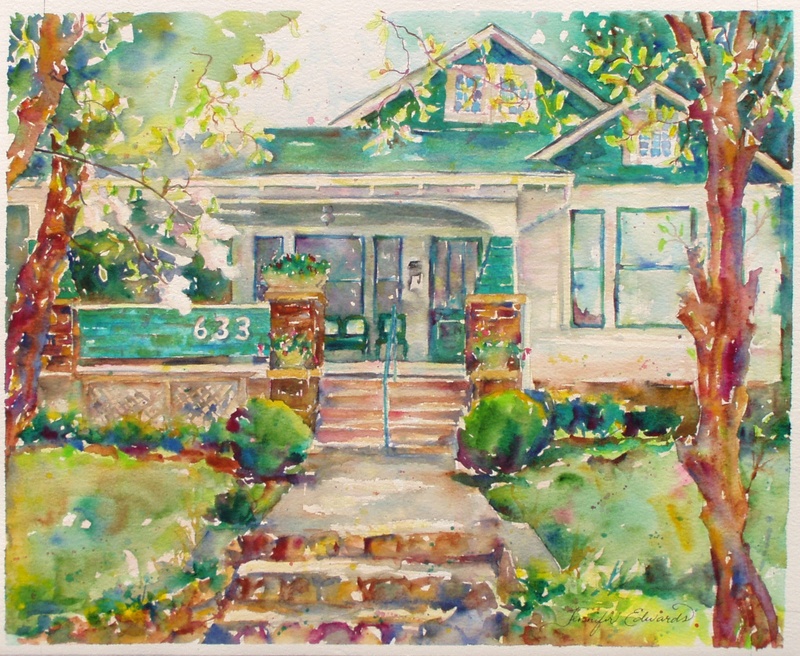 This one was especially enjoyable to paint: the current owner of our previous house commissioned me to create this watercolor as a gift for her husband. It was wonderful to revisit this grand ole house built in 1922. Our family loved the six years we lived here. My older two kids were just wee tiny tots. Maddie only lived in this house for less than a year before we moved to Kernersville. The craftsman-style bungalow has more charm and character in its 1100 square feet than our current suburbia-style home. Each has its advantages though. It was lovely to take a trip down memory lane as I painted. I LOVE this house!! Brilliant work! Absolutely beautiful!Just seeing that house again brings back such good memories! This is so awesome! Not your average house painting, it is full of light and character. This is awesome! Thanks for sharing Jennifer! I’m sure that the lady loved it! Your work is just terrific! WOW! That is one beautiful house portrait. I’m sure they will be happy with the result.